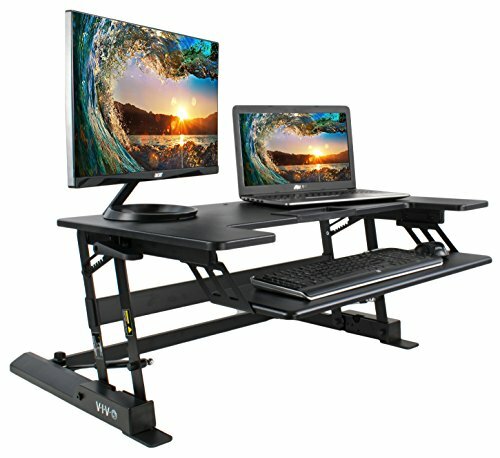 New adjustable standing workstation (DESK-V000B) from VIVO. Find that much needed healthy balance of sitting and standing throughout the long work day with DESK-V000B, our sit to stand desk that changes height in seconds by using the innovative height lock mechanism, activated by pressure handles on each side of the stand. The large expansive surface provides great space for single or dual monitor setup, while the lower deck holds both keyboard and mouse side by side, creating a comfortable work space. The height of the surface can be adjusted from 6.5" to 16" and locks at eight different intervals, allowing you to find your proper comfort level. Double gas springs create smooth and quick transitions and the sturdy base offers great stability at every height level. The bottom of the base features non-slip pads that protect surfaces from scratches. DESK-V000B is an affordable standing desk solution that sits directly on top of your current desk. Perfect for schools, offices, and home use. Very minimal assembly is required out of the box!